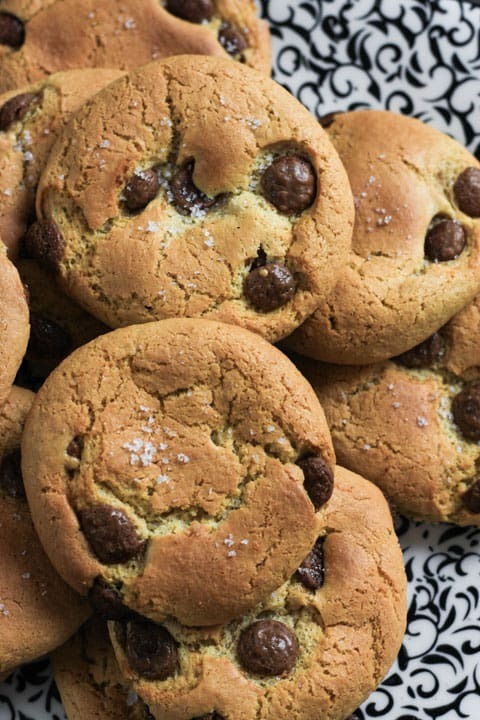 These Easy Flourless Salted Chocolate Chip Cashew Cookies will become an absolute staple in your kitchen. 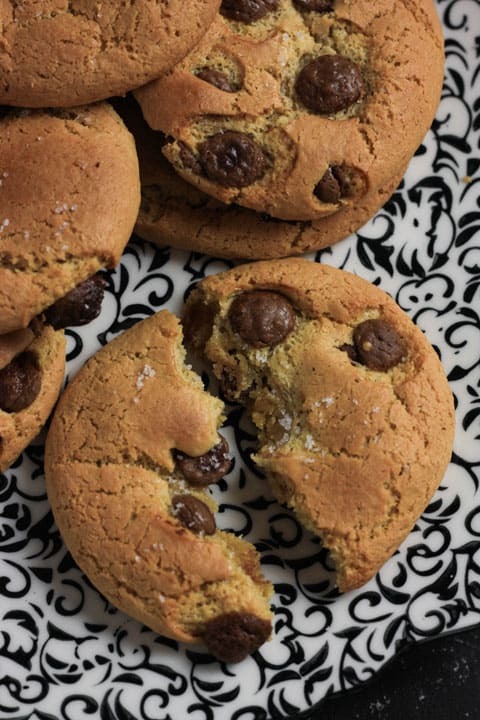 They take no longer than 15 minutes from the second you enter the kitchen to your first cheeky nibble on a warm salty and chocolate molten cookie straight out of the oven. It’s quicker than a stroll to Tesco and better than any gluten-free cookies you can buy there or anywhere. 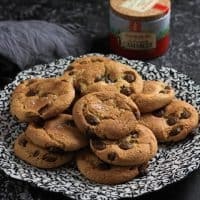 The secret ingredient is cashew butter which replaces the flour and butter you would use in a standard chocolate chip cookie recipe without compromising taste or texture. The cookies have a soft chew and a lovely undercurrent of sweet cashew which isn’t overpowering in the slightest. 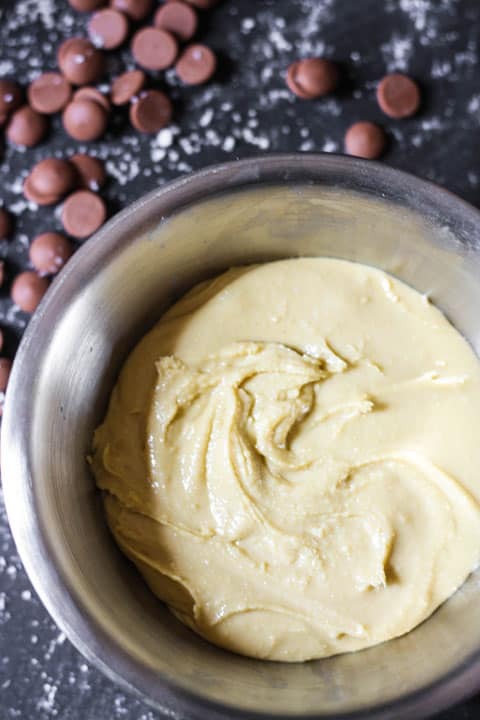 All manner of nut butters are ubiquitous in the supermarkets these days but if you want a homemade affair that is cheaper, silky smooth and the easiest ingredient you will ever make for your larder then visit my recipe here. It is still a surprise to people when I explain how easy it is to make nut butters – the only ingredients are nuts. No actual butter. So this makes it okay when you laden your toast in half a block of salty butter before slathering on an obscene amount of cashew butter. Salt is always the name of the game in my baking arena and here I require fleur de sel, crunchy little crystals of salt hand-harvested in Brittany. 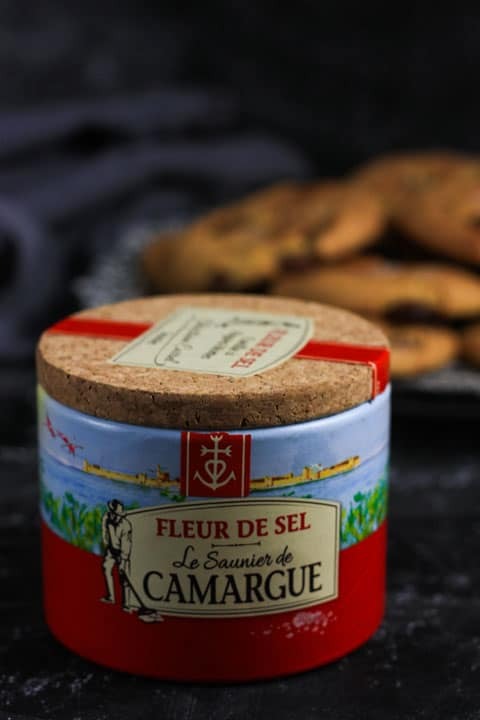 Of course you can use normal sea salt but then do reduce the quantity a little as fleur de sel is particularly gentle. These cookies have become a godsend of late. I have been darting around the country visiting family, going on hen weekends, baking for my cake stall in this interminable heatwave and holding my patience with a baby who has just realised he is a tantrum throwing toddler and is making the most of his new identity. A cookie, a cup of tea and a sit down has been the only thing I have craved these past few weeks. Oh, and more sleep but that goes without saying for any mother. 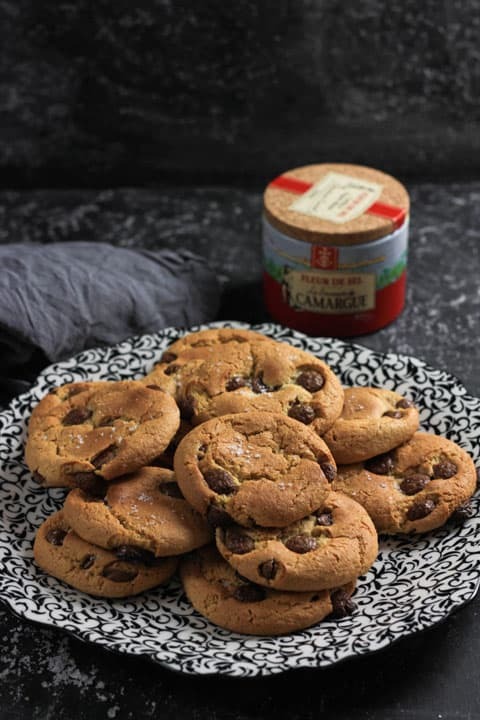 Plus with all the frenetic cake stall baking I want to relax the pace with a laid back cookie that only requires a mixing bowl, wooden spoon and no more than seven minutes in the oven. So easy and so perfect. 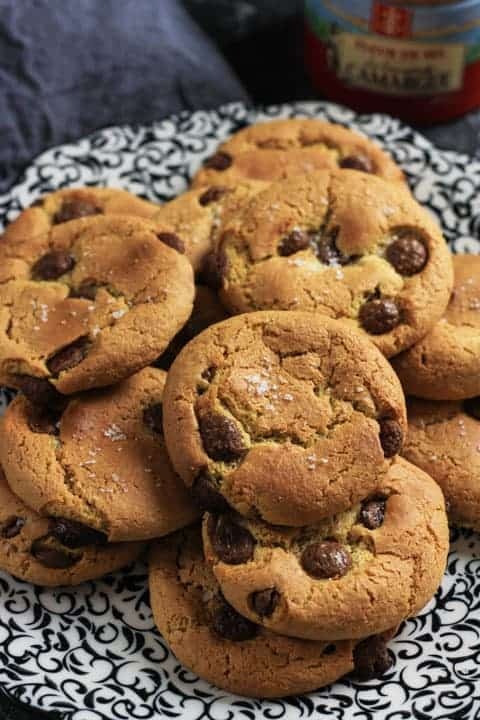 Easy Flourless Salted Chocolate Chip Cashew Cookies are foolproof, with minimal ingredients, no fuss and are absolutely delicious. Pre-heat oven to 180°C /160°C fan/gas mark 4 and line a large baking tray with baking parchment. Whisk the egg and sugars together in a large mixing bowl until combined. Add the cashew butter, bicarbonate of soda and sea salt until the batter is smooth and thick. Finally stir in the chocolate chips until evenly dispersed. 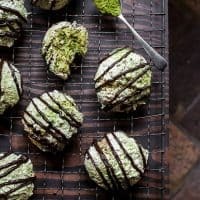 Leave for a couple of minutes for the dough to set then using the palms of your hands roll up the sticky dough into balls of about about 30g each and place on a baking sheet a couple of inches apart. Crumble a little salt on top of each cookie and press down slightly. Bake for 6-8 minutes until the cookies are just turning golden. Remove from the oven and leave on the baking sheet for 5 minutes to firm up before moving them to a wire rack to finish cooling. Making your own cashew butter is easy. See my recipe here. As easy peasy and delicious as you said. 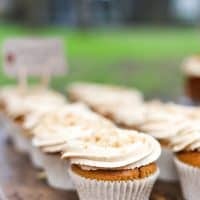 Have recently become intolerant to wheat and this is the second gluten free recipe of yours I have tried. The first was the cauliflower pizza base, and I am going to try the mini blueberry muffins next. 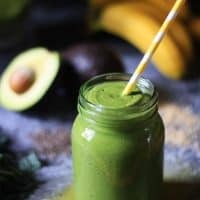 Hi Jo, thank you for your comment – I really love this recipe so I’m happy you had such success with it as well. Let me know how you get on with the blueberry muffins!